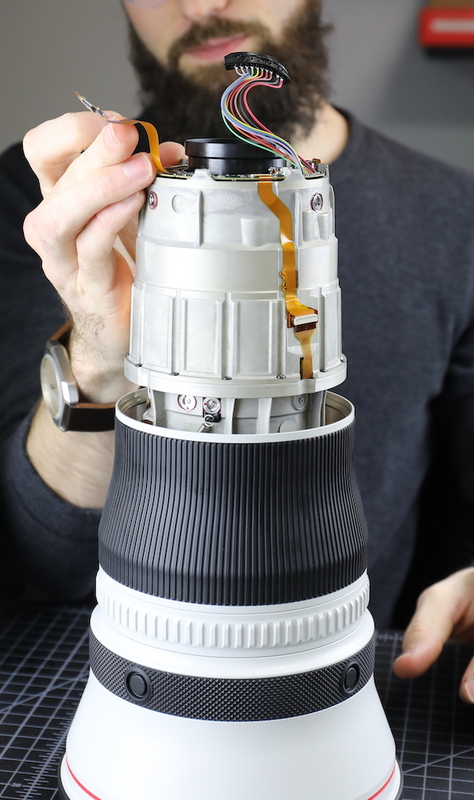 We tend to not publish tear-downs of super-telephoto lenses. They’re big and heavy, always well made and well engineered, like you would expect in something that costs as much as a used car. Big, heavy, and boring don’t make for an interesting teardown. So we take them apart, make our in-house repair manual, and don’t put it on the blog. 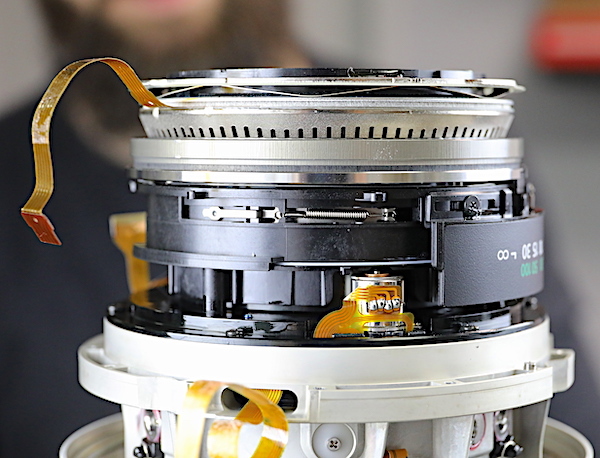 But when the new 400mm f/2.8 lenses were released we decided it was finally time to publish a teardown of one. Largely, because they are amazingly light (you see what I did there? largely light?) and we were really interested in how they did that. I remember when shooting a 400mm f/2.8 was not only a statement about your disposable income or professional status (or both). It was a statement that you were a manly man, able to toss around a massive piece of optics and mount it to a tripod sturdy enough to double as a small crane on a construction site. Now they have one I can handhold. For a couple of shots, at least. In this case, there was also the added attraction that both Canon and Sony released nearly identical, lightweight, optically excellent 400mm f/2.8 lenses at the same time. So this gives a chance to compare the two. Sony lenses have lagged a bit behind Canon in lens’ build quality, but they’ve been catching up. This looks like a giant leap for them. We’ll do the Canon 400mm f/2.8 IS III first because Canon has been at this a long time and because there were several of the Canons in stock today. Also, this will give the Sony fanpeople a full week to bash the Canon lens, because that does seem to be what they live for. You know it’s a super telephoto when disassembling the tripod ring gets its own section. 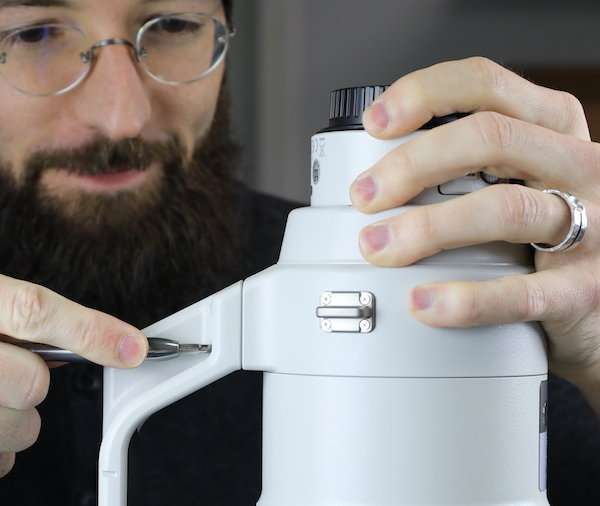 But they really are rather complex and actually, this is the part of the post a lot of people might actually use – cleaning out a gritty tripod ring is pretty easy and straightforward. First, of course, we remove the tripod foot. 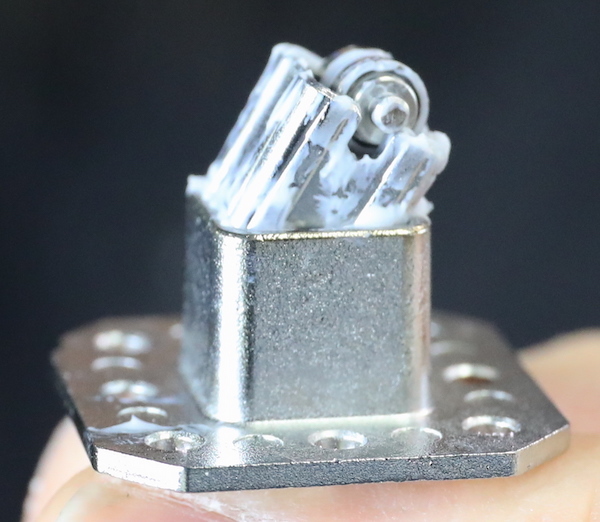 Underneath the foot is a couple of plates that cover the click assembly. 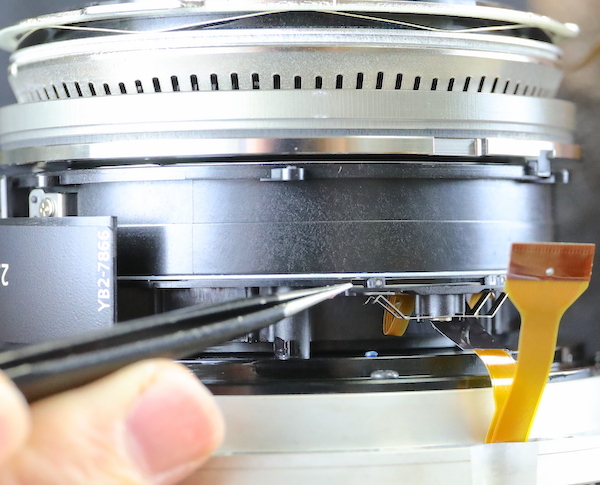 Taking off the upper plate releases the pressure spring. There’s plenty of lube in there, so the spring doesn’t try to leap across the room, as some springs do. 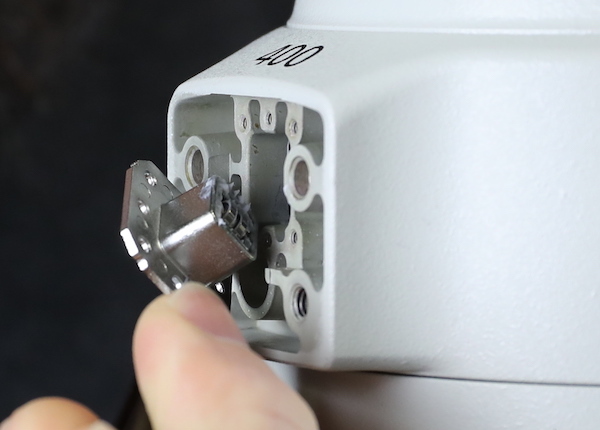 The other four screws hold in the click assembly. This is a simple roller in a casing. The spring pushes the roller down against the lens barrel. And as you turn the tripod ring around, you feel that satisfying little click every time the roller passes over one of the grooves in the lens barrel. If you notice in the image above, there is a nice, round hole below the click mechanism. 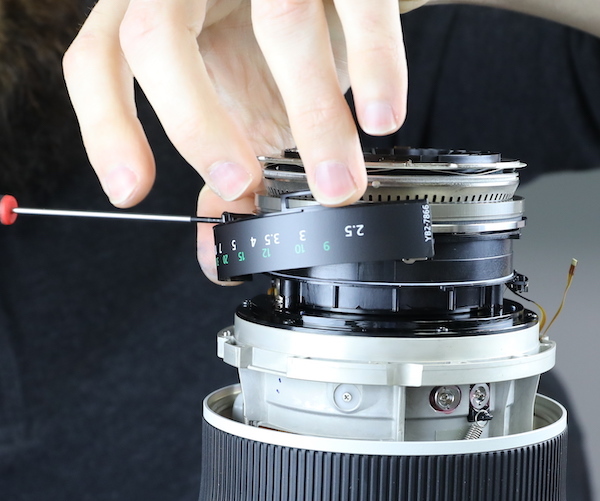 When you rotate the ring around you can line that hole up with the roller assemblies the tripod ring glides around on and remove them. If your tripod ring starts to catch when you rotate it probably means that one of the roller screws got a little loose and backed out a bit. Simply tightening it should fix things. 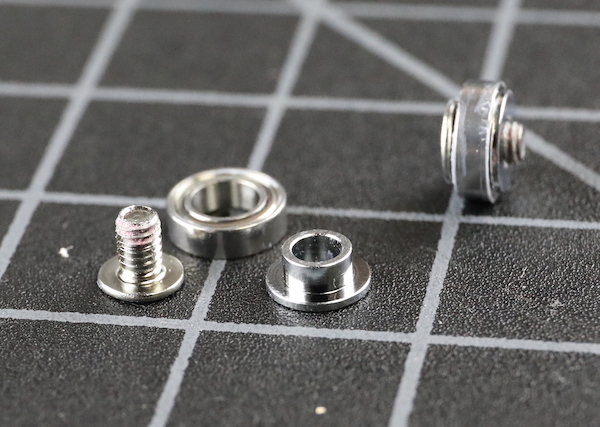 The rollers are in three pieces: the screw, a sleeve, and a ball-bearing roller. Once the rollers are removed, the tripod ring slides off. 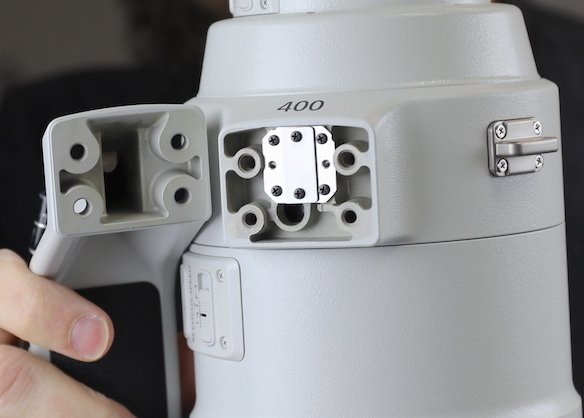 This is nice — some super telephotos won’t let you remove the tripod ring without removing the rear barrel. 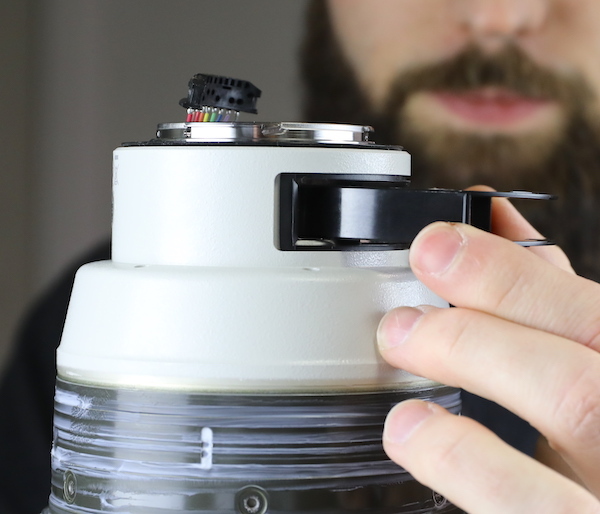 You can see one of the click slots in the barrel, filled with white lubricant. Before we get to the real disassembly, we took out the drop-in filter, which we really, really, really like. Why? 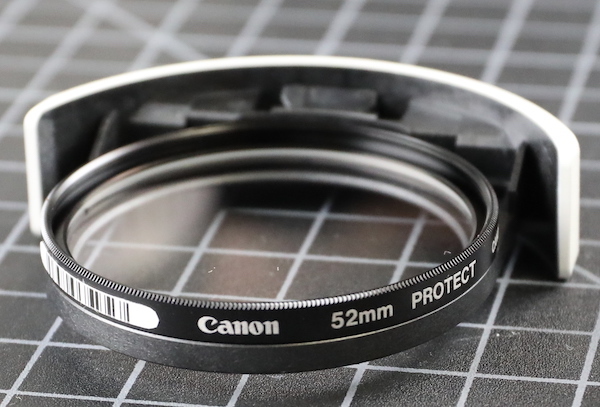 Because instead of being a proprietary $200 filter, it’s a holder that you can attach any 52mm filter to. So if you scratch it or want a CP filter, just buy a standard 52mm replacement filter. 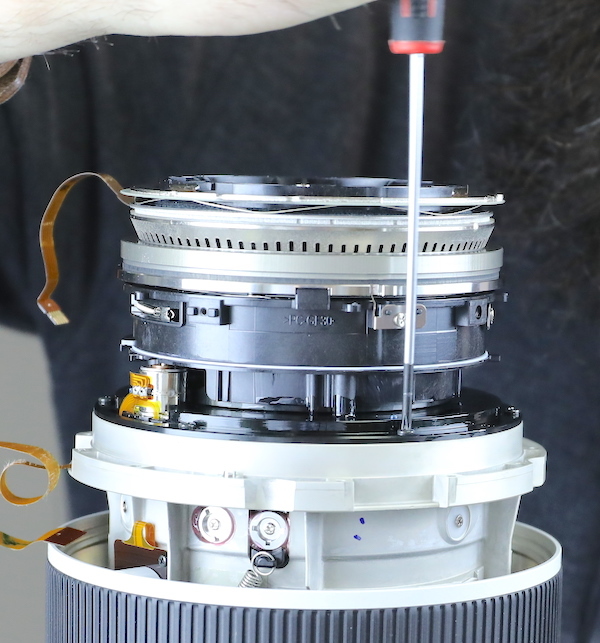 There’s a screw through the side of the lens that holds the filter holder assembly in place. 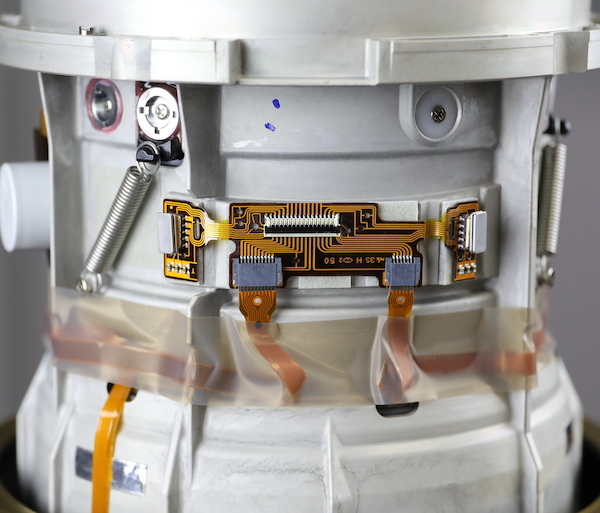 After this is removed, a couple of circuit connectors that are attached to the filter holder with double-sided tape must be freed up. We could have taken off the switch panel and disconnected the flexes there, but it wasn’t really necessary. After that, the filter holder can be popped out; it snaps into and out of place. The electrical connectors are detached from the bayonet, and those circuit boards moved so the flexes are away from the barrel and free. There’s no need to detach the bayonet mount or switch assembly from the rear barrel. 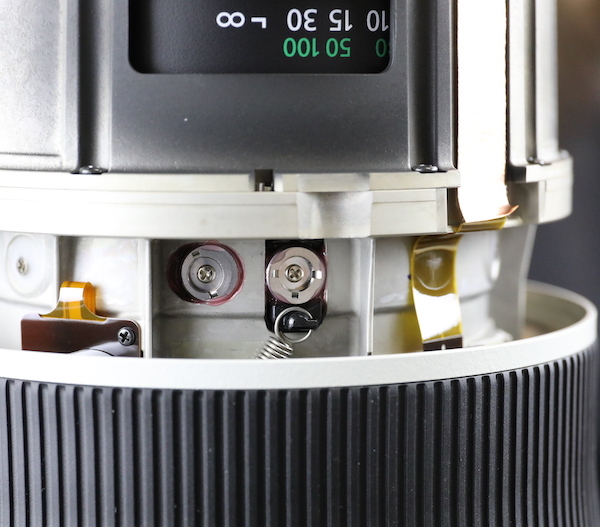 The barrel is attached to the inner lens barrel with six large screws. 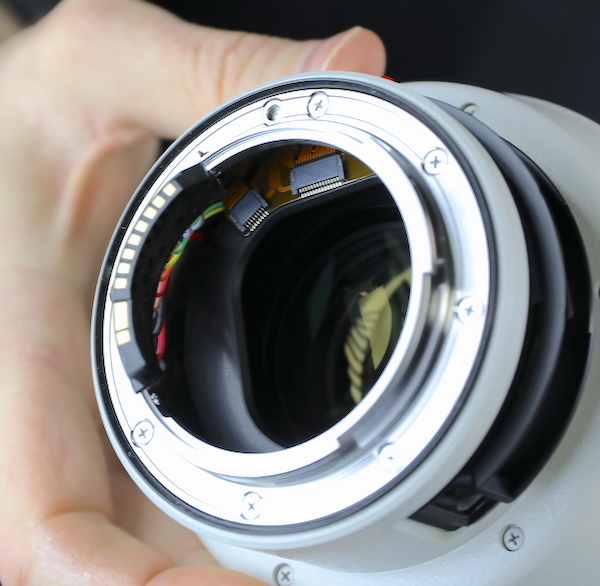 After those are removed, the rear outer barrel slides up off of the lens assembly. The lens is lightweight, but the inner, weight-bearing barrel is very sturdy magnesium alloy. And another set of eccentric collars near where the two barrel halves join. A couple of interesting things are in this image. First, you see the two barrel halves are joined without shimming and held tightly together with 12 large screws – it’s a very strong joint with interlocking pieces. 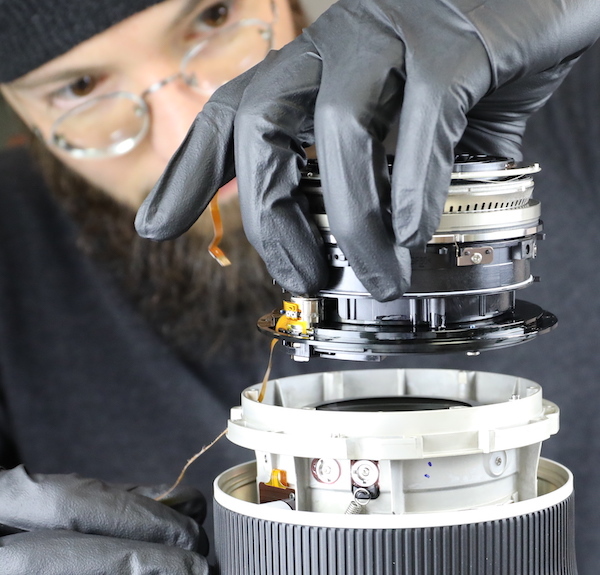 Also, as we saw with the RF 50mm f1.2 tear down, there are springs going down to the focusing ring, we assumed to put tension on a ball bearing ring for a smooth focusing feel in this electronically focused lens. We assumed wrong. A quick view of the main PCB in place. Before Aaron takes it out of place. 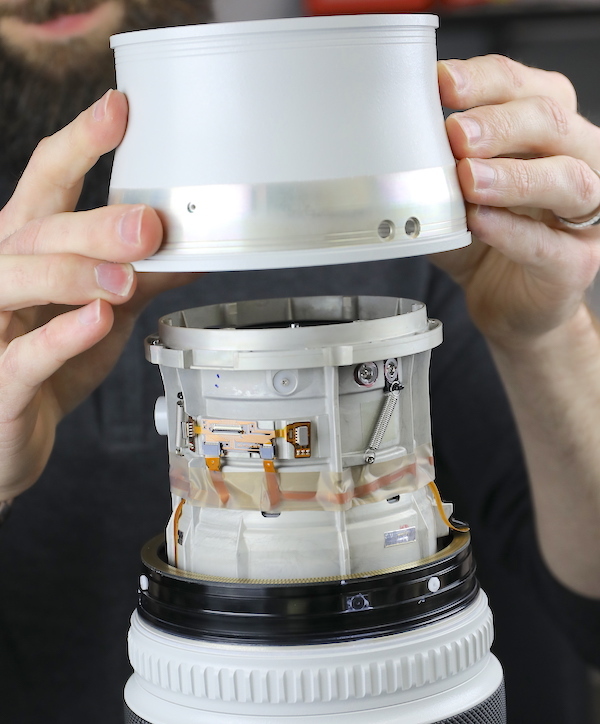 Next, we detached the flex connectors around the barrel and take out the 12 screws joining the two halves. Yes, 12 screws. I meant what I said about Canon engineering for strength. With those out the barrel comes apart. 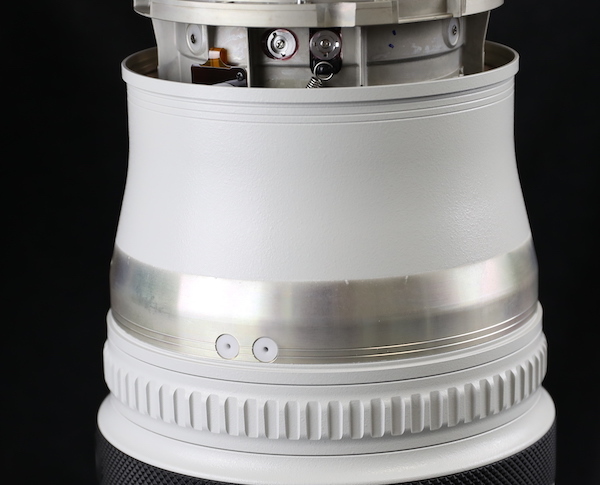 Looking up into the upper half of the barrel we see the IS unit. This is what those rear eccentric collars adjust. It amazes me that people consistently believe stabilizers work on the principle of ‘and then magic happens’. They are optical elements that have to be corrected for tilt and centering like other critical parts of the lens’ optics. An angled view gives you a better idea of how large this IS unit is, it’s close to 2 cm thick, filled with electromagnets, springs and sensor inputs. And optical elements. Did I mention that stabilizers are optics? 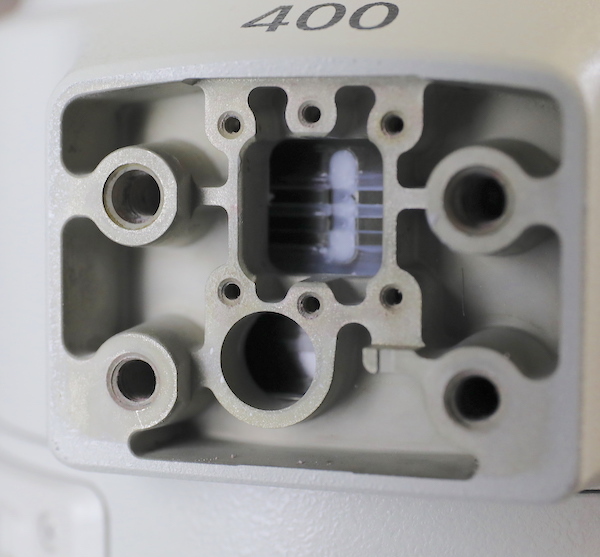 Looking at the front half of the lens, we see the focus USM motor sitting proudly atop everything. It is, to all appearances, exactly the same motor we saw in the RF 50mm f/1.2 lens, with the same Tensioning Spring of Unknown Purpose along the side. This is really interesting information, that the same motor and electronic focusing system is used in both lenses. 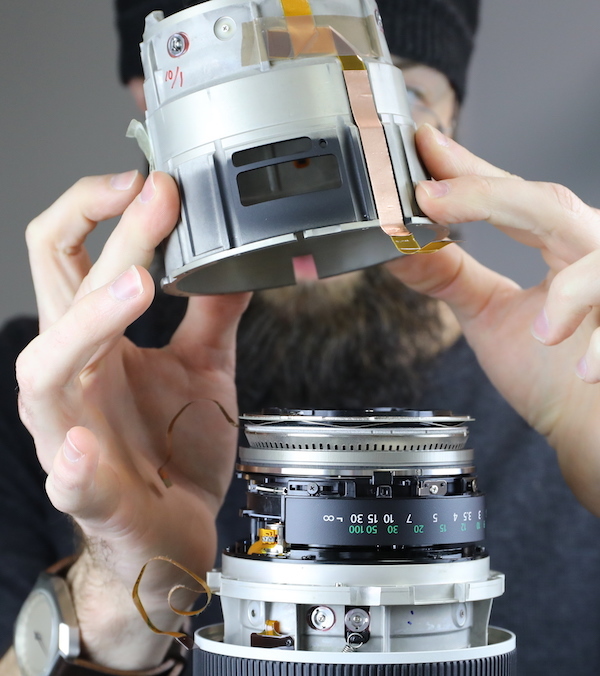 Of course, the 50mm has a lot of glass to move around so it makes sense that it gets a big-boy motor. But both of these lenses are high precision focus-by-wire focusing systems. Both have the same spring tensioning system and position sensors in the focus barrel. Obviously, there is a business advantage in using the same subsystem in several lenses. But putting the same electronic focusing system in this EF lens makes me think that going forward Canon lenses may have a lot of internal similarity in either RF or EF mount. Converting the Canon 400mm f/2.8 to an RF wouldn’t be quite as simple as a different rear element and an RF bayonet mount, of course. 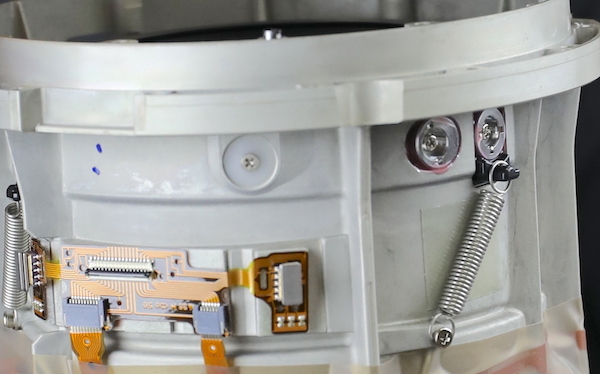 The additional electronics for the RF Control Ring would have to be stuffed in here and probably some optical tweaks made, but the core structure could be very similar. 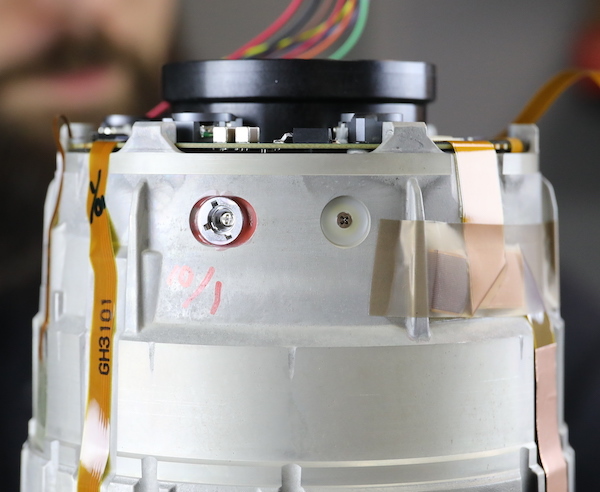 Looking around some more, we start to see this is really the electronics barrel, not just the focusing motor. The aperture assembly and motor are here. 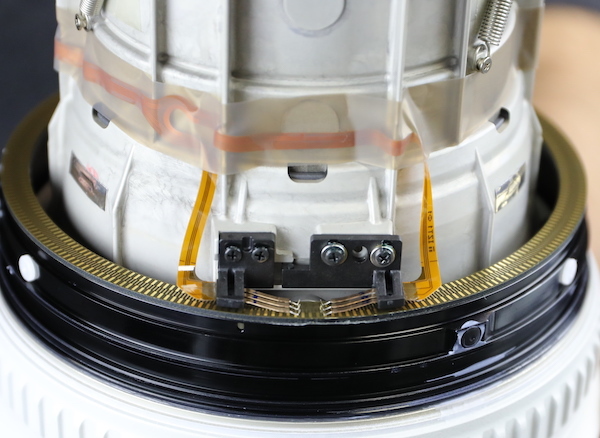 There are focusing position sensors mounted underneath the ring assembly, too. 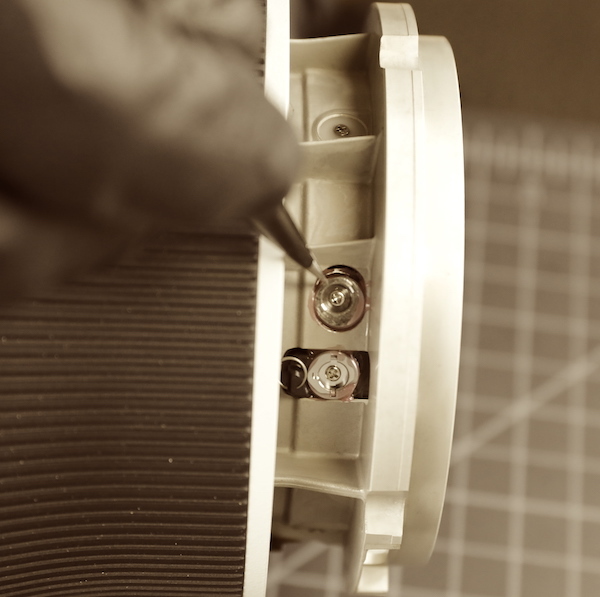 And a number of lens elements inside the motor assembly. Not surprising, since Canon let us know they had moved the glass further back in the lens, as much as was possible. Getting back to our disassembly, we have to take off the distance scale just because it’s in the way. 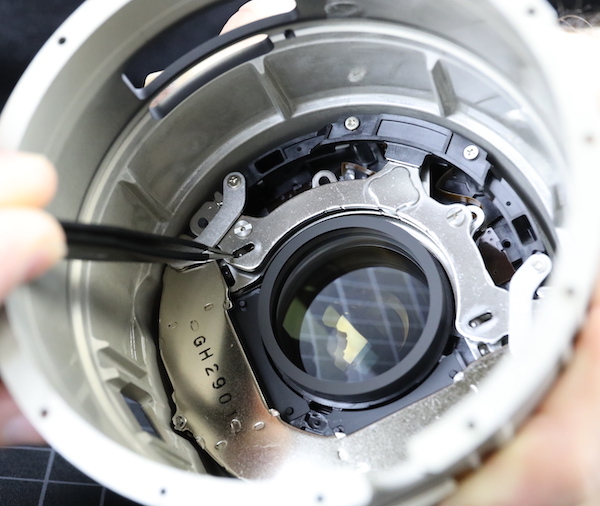 Then we can remove the screws holding the focus assembly onto the front of the lens. Just six smaller screws here, since this is not a load bearing assembly. 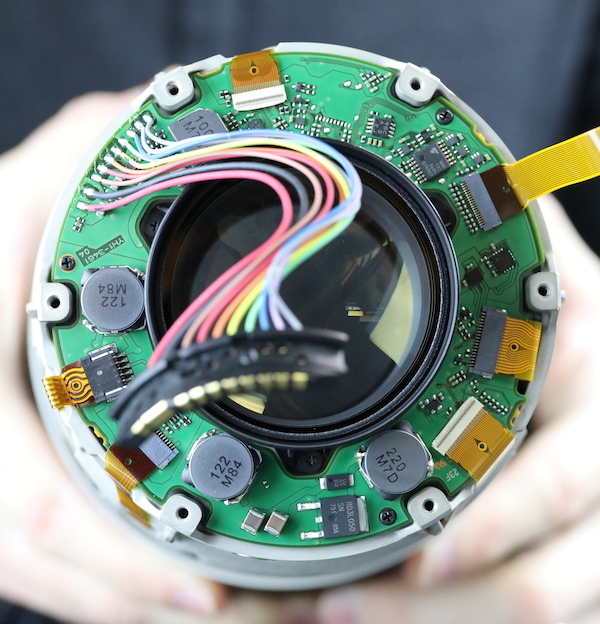 The entire module with focus motor and elements along with the aperture comes off as a single part. 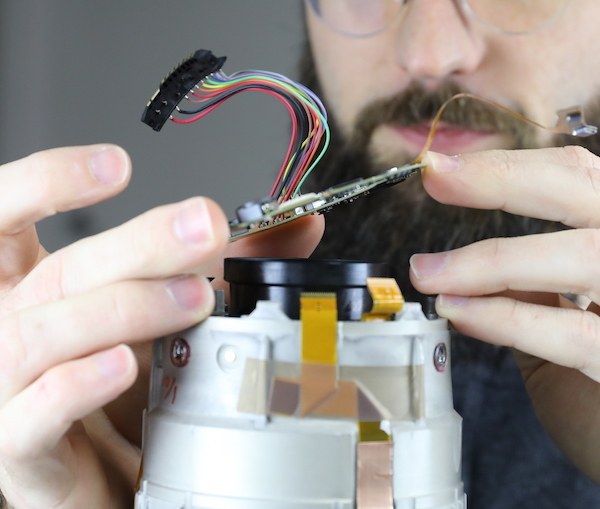 The long, winding flex to the aperture assembly is just begging to be torn, hence Aaron’s unusual degree of concentration. 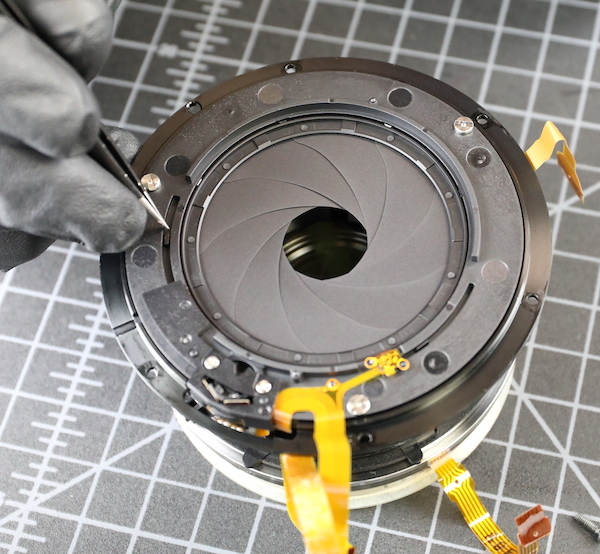 The aperture assembly could be easily removed from the focusing portion of this part. It’s held in by three screws and obviously has its own electrical connections. But we really see no reason to take it off. 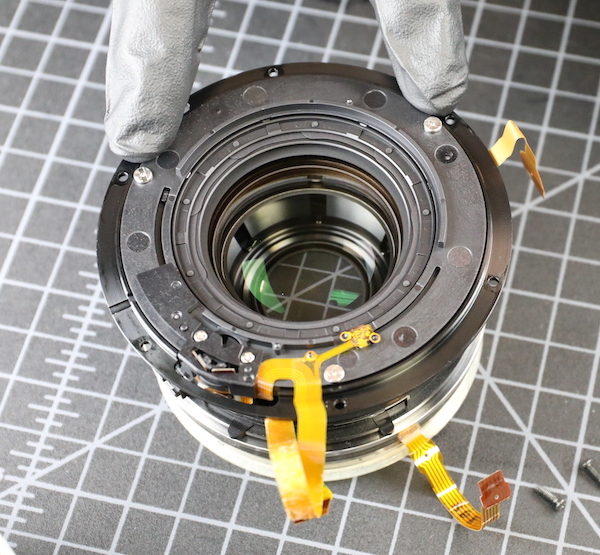 As expected, the lens has a nice, nearly circular aperture ring. The flex/sensor on the right side reads home position for wide open. Looking towards the front of the lens we can see a good-sized fixed group. 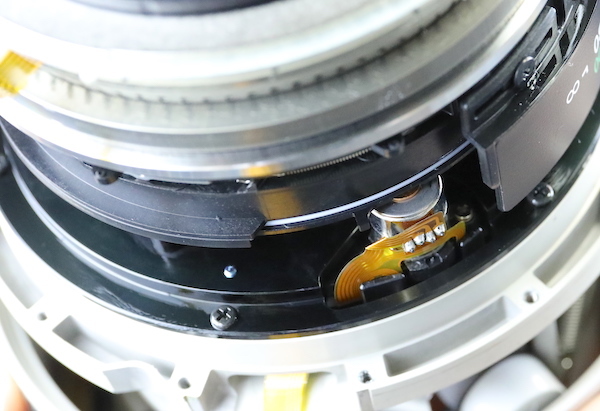 We can also peak down inside the focus ring where springs and rollers and such are apparent. From the side, we can see that this is yet another adjustable element, with large eccentric collars in pairs to adjust centering and tilt. The focus rubber does not come up without a fight, it’s accurately molded to the underlying ring. Once it has been removed, we can see the nylon posts that hold the outer focusing barrel to the inner barrel. 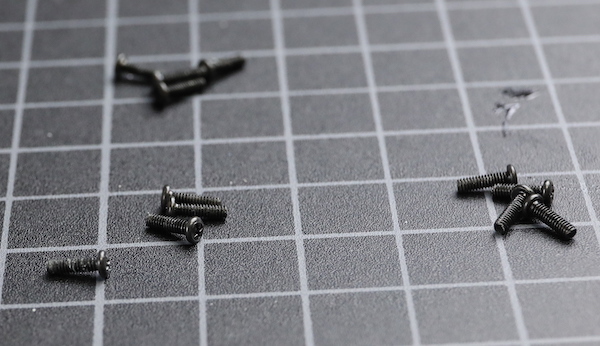 There are two small flat-head screws, too. The posts are pretty snuggly popped into place and have to be plucked out. 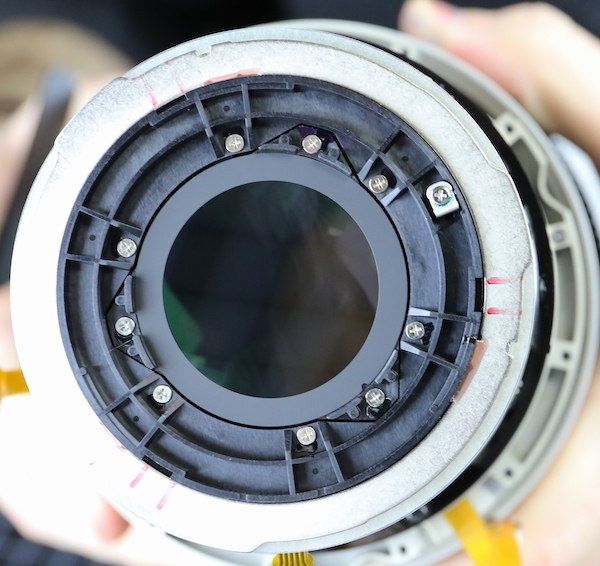 Once all the screws and posts have been removed, we can slide the outer focusing barrel off of the lens. Now we get a good look at the springs and adjustable eccentrics. And then spent about 20 minutes trying to figure out how it all works, because it just wasn’t what we expected. 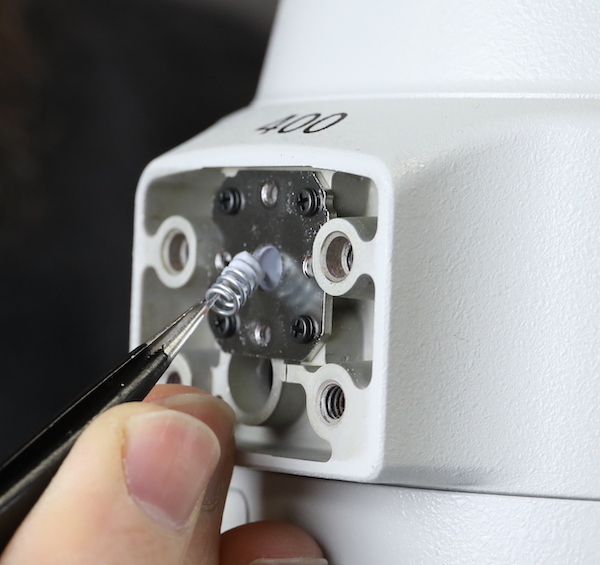 You can see above that the spring we thought might tension the focusing ring actually moves from that adjustable element to a post on the side of the inner barrel. There are three sets of post-eccentric-spring eccentric around this element. As best we can determine, the spring tension pulls the element toward the front of the lens. (To be clear, this isn’t an element that moves; it stays in one place. The eccentric at the spring adjust lens centering and the other eccentric adjusts tilt (and therefore moves the element against the spring’s resistance). 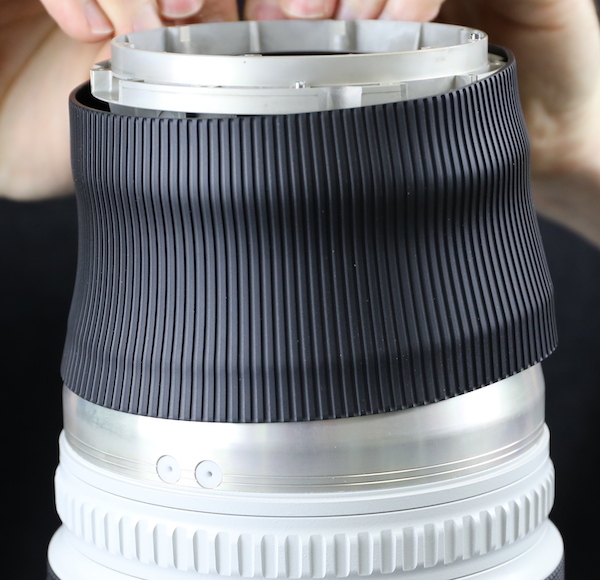 We do not know why this is a better way than simply rotating an eccentric collar in a slot but we’ve seen it on a couple of Canon lenses recently. Our best guess is it either allows a greater range of movement or works better with the separate glued in post. Actually, that’s Aaron’s guess. My guess is they just do it to confuse me. If that’s the case, they have succeeded. But one day we’ll spend 4 or 5 hours playing with them and figure it out. But don’t tell Canon that; they get aggravated when we do void-the-warranty stuff. Oh, wait, we already voided the warranty back when we first opened it up. A couple of other sensors to show you before we go. 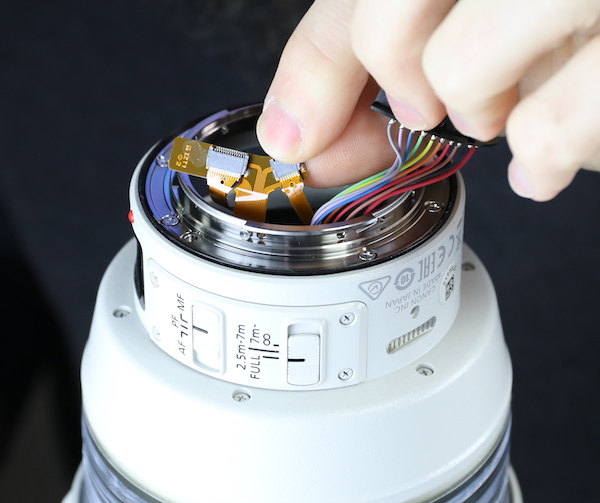 Down at the bottom, there is an electrical brush sensor on the focusing ring. Why electrical rather than optical? Probably it has something to do with the large size of the ring, and perhaps because it may be a directional sensor. 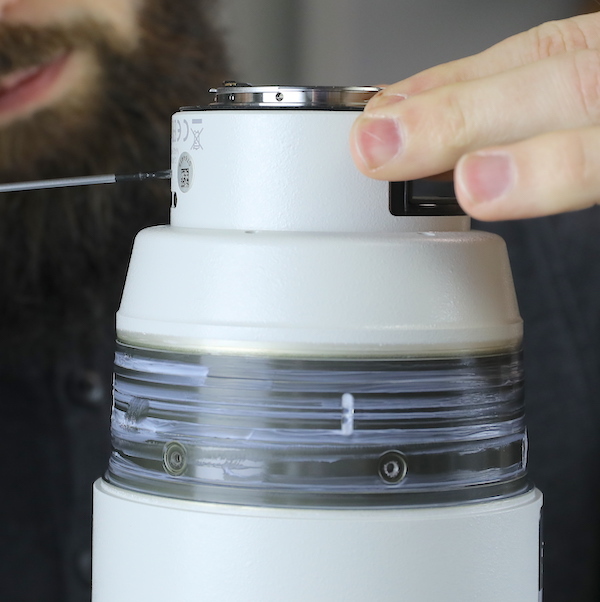 This is, like most electrical brush sensors, calibrated by slightly moving the sensor in relation to the ring and then fixing it in the proper position. On the other side of the front barrel are some IS motion sensors. 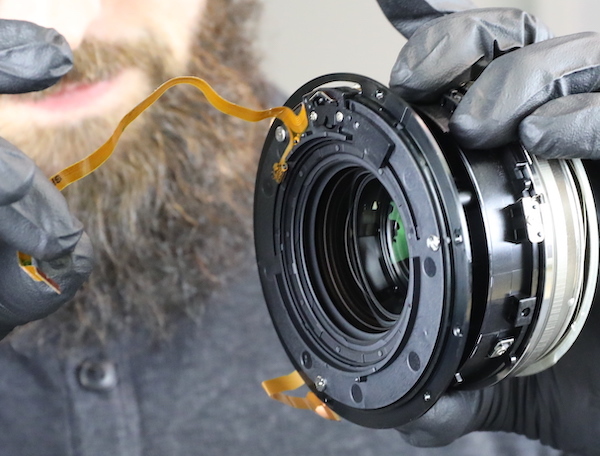 Further disassembly, honestly, would mostly show you air and a big front element; Canon did a marvelous job of moving most of the glass back towards the camera, which makes the lens feel even lighter than it is. So we’ll call our disassembly done at this point. Some things we were already aware of or assuming. 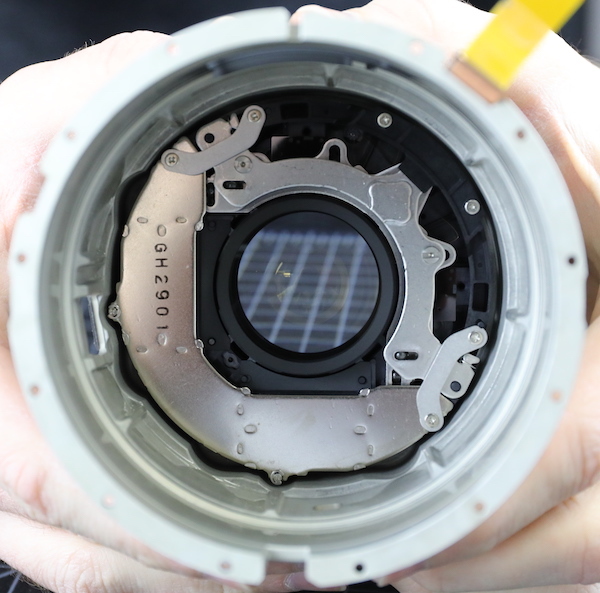 The lens elements are moved towards the mount side of the lens. 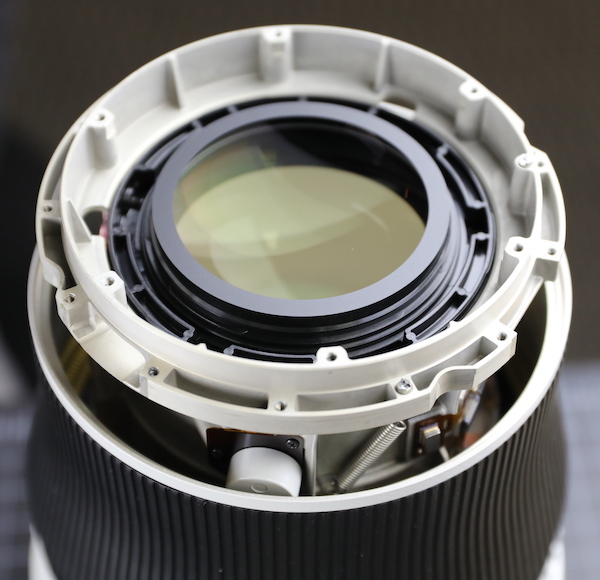 There are lots of optical adjustments like all Canon lenses. Despite being far lighter, it’s still very solidly built with a very strong frame, tons of big screws holding everything together, and no weak joints that we can see. 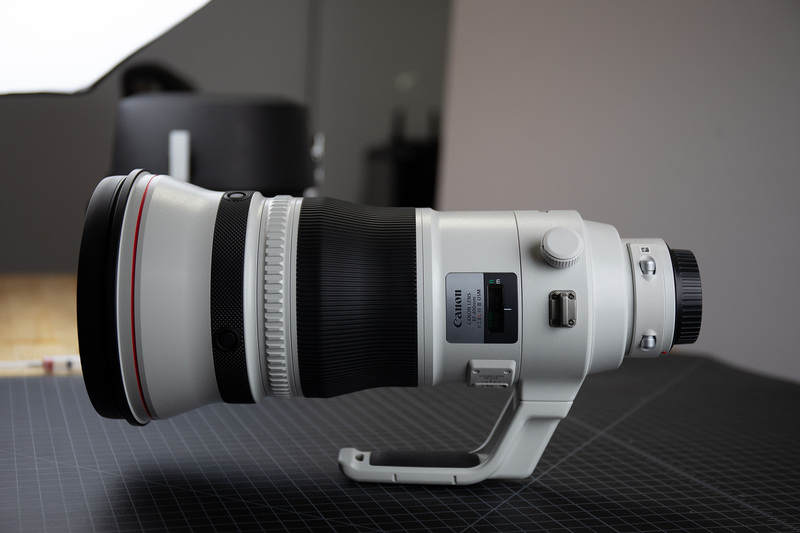 It’s what we expected; Canon’s been building super telephotos for a long time. There were some other, more interesting things. The spring-loaded adjustable collar collection is something of a mystery to us and will remain so until we can spend some days doing optical adjustments on one. The use of the same motor as the RF lens is very interesting in several ways. 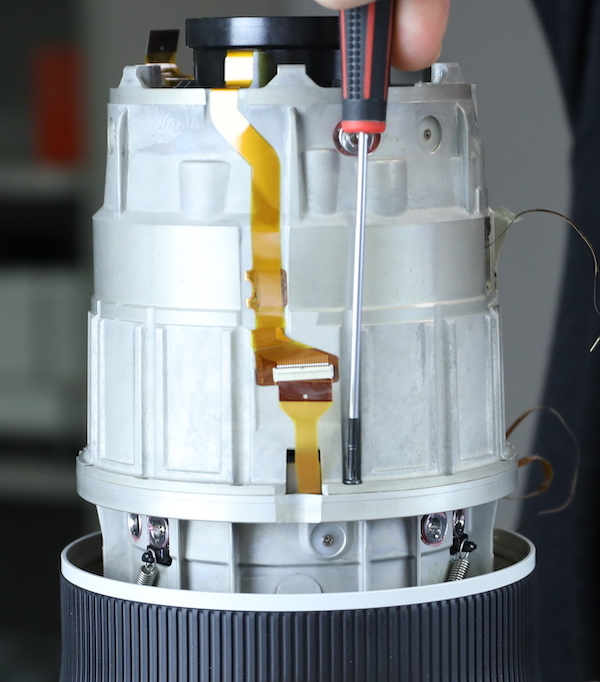 Only some more tear downs will tell us if this is just a superior motor type that Canon is going to use in all electrically focused lenses (I suspect this is probably the case), or just in lenses with a lot of glass in the focusing element (another likely thing). 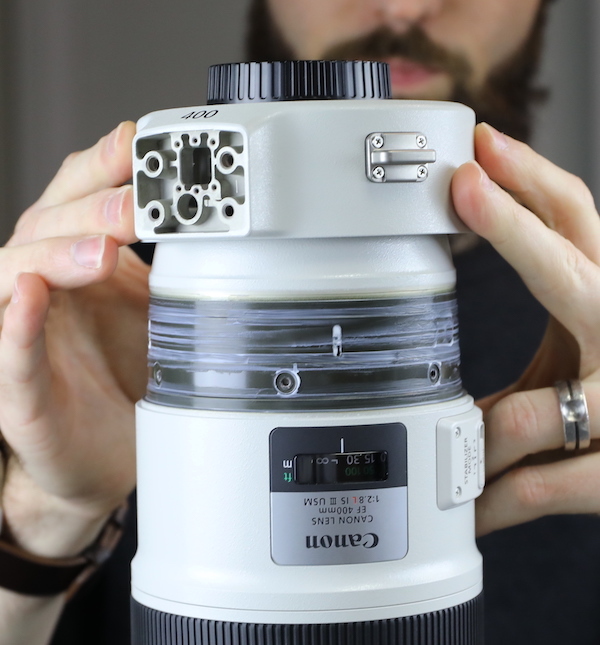 Canon has really been very quiet about this lens, despite the known changes inside. I had a lot of trouble finding out which elements are fluorite (two of them are, apparently). There has been some talk about improved focusing speed and accuracy, which I assume has something to do with the new electronic focus system, but not much. But even if the marketing is simply ‘as good as before and 25% lighter’ that should be plenty to make this lens, and it’s 600mm sibling, very popular. Well, you know, super telephoto very popular. Probably the more interesting teardown will be comparing this one to the Sony 400mm f/2.8 G lens. Hopefully, it is awesome and for once the Sonyfans* won’t line up 6 deep to explain how what I find is wrong again. Taking a trip all across the globe is an excellent and intriguing dream. We work twenty four hours a day in our company to change this dream into reality. However how many really able to earn? We bring to you, this amazing internet based job opportunity designed in a way that it will help you to make great money. Do the job on a daily basis and give your work handful of hours and get as much as $22000 each and every week. It provides you with chance to work from anywhere with extremely flexible time and spend some quality time with all your family members. It is time to transform your life and bring growth and happiness and joy. Now go and take a look at, superb things waiting for you >>> SUPERB OPPORTUNITY!!! Taking a trip all around the world is an attractive and fascinating dream. We work twenty four hours a day in our office to change this dream into reality. However how many really able to make money? We bring to you, this awesome on-line job opportunity made in a way that it will help you to generate good money. Do the job on a daily basis and give your work small number of hours and gather up to $46000 every week. It provides you with possibility to work from anywhere with flexible time and able to dedicate some quality time with your family. The time has come to convert your life and bring growth and happiness. Now go and take a look at, impressive things waiting for you >>> SUPERB OPPORTUNITY!!! Calcium-fluorite, CaF is the material they use. A crystalline material whereas glass is just glass. There are hybrids, namely Schott FPL-53 and now 55 which are CaF/glass hybrids, sometimes referred to as fluoro-crown glasses. Though they are still not as good as pure calcium-fluorite for control of chromatic-aberration, they are easier to polish to a better finish. Fewer air-glass surfaces is always better. You can always add a filter. From the design it looks like there’s no more protective front element… Don’t know whether that’s good news. “Did I mention that stabilisers are optics”. “JDV Products Inc. is Vessel Japan’s Exclusive North American Distributor. […] JDV Products, Inc. is a WBENC (Woman-Owned Small Business) and has been manufacturing a broad line of wire wrapping and unwrapping tools for the past 30 years at our Fair Lawn, New Jersey facility. 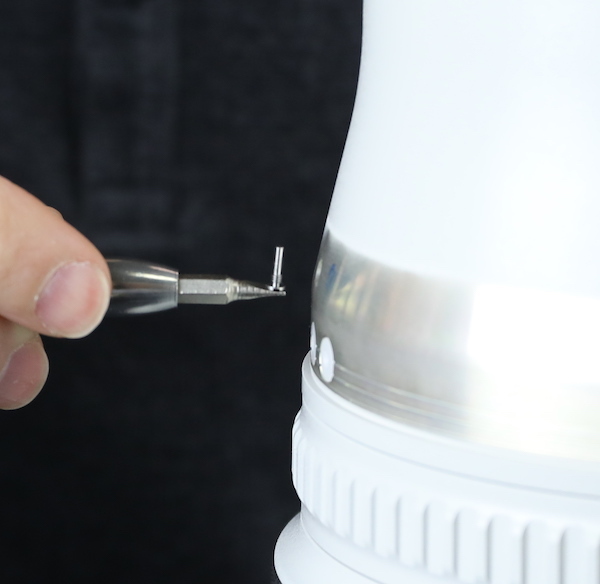 […] Does your Phillips® screwdriver “cam-out” and damage screws? If so, it may NOT be a US Phillips® screw – it may be a “JIS” (Japanese Industrial Standard) type! That is why you need VESSEL Japanese Cross-Point Screwdrivers! […]”. OMG. So many things I have learned today. So what to do with my set of Wiha Precision Philips screwdrivers now? Correction: Seem to be Wiha PicoFinish, the 261P served me well resolving the dreaded CHA-Bug which infested my Nikon D70 decades ago. Got blisters on my hands from all those tiny bastards. P.S. 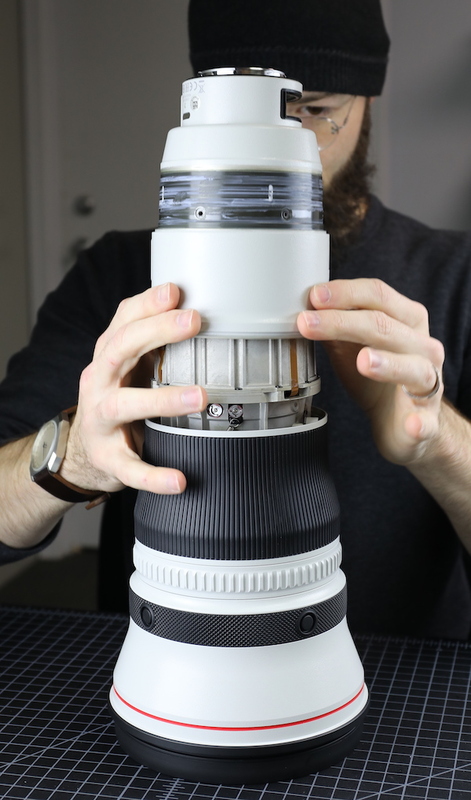 : No way, I would DIY a telephoto lens. When my 70-200 VR I F/2.8 Nikkor’s ultrasonic AF motor started sqeaking, I brought it right to my local Nikon dealer. Who – needless to say – replaced the whole unit. Free of charge, since it was oh-so-slightly within warranty. Attention !! Don’t do this at home and don’t show this article to yours childrens. annomal, I think it just depends where you go. My irritation comes because fairly suddenly (about 4 months ago) we started getting tons of ‘Sony is better’ comments about things that have nothing to do with Sony and are really stretches – comments on Sony sensor in articles about lens build quality, etc. And I notice a fair amount come from annonymized IPs, which makes me think bad thoughts. Seems like they might have something big in the works! It is absolutely possible. It would probably be way less than ideal optically, in other words it would likely increase aberrations. It’s possible the optical design included compensations for that, but I doubt it. For example, Cine lenses that have interchangeable mounts and therefore the same lens can be tested at different backfocus distances. Almost all of them have a ‘best performance’ mount they were designed for and aren’t quite as good at other backfocus distances. Similarly we can test a lens focused past or just short of infinity on the optical bench by changing the backfocus distance and there is usually some fall-off of performance. Sometimes minor, sometimes dramatic. So in theory, Canon could release a camera with a larger sensor set further back from the full-frame focusing plane, maintaining the same focal length, but losing a stop-or-so of light. An RF 28-70mm f2 would become a medium format 28-70mm ~f2.8ish? 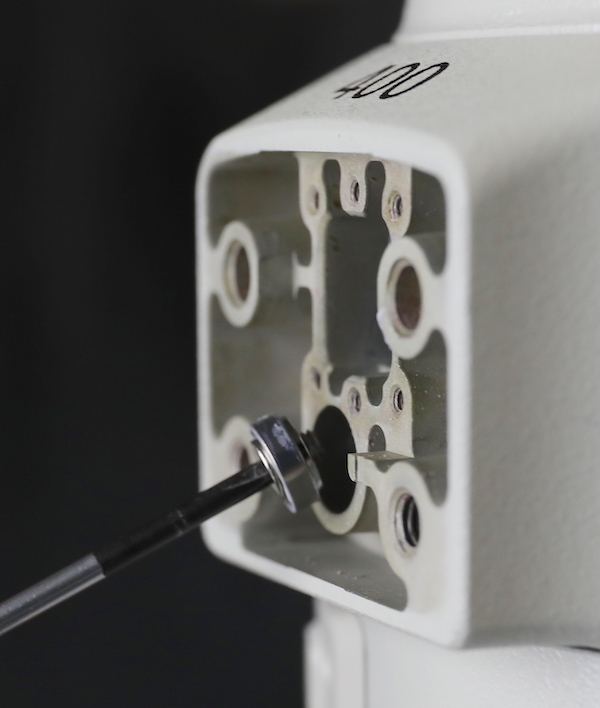 With focus by wire, the camera would tell the lens how to behave on different sensor sizes. Am I missing something or is this not entirely possible with these new RF lenses? Nelson, almost all SLR lenses can focus past infinity. 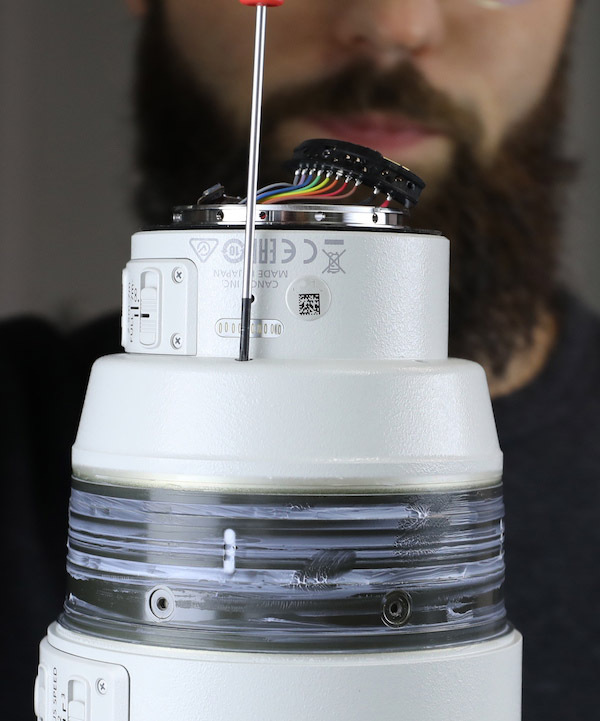 The use of focus by wire on all of the new lenses makes me wonder if they’re engineering in some compatibility with a future body with a larger sensor. Is there any indication that these lenses could physically focus past infinity? 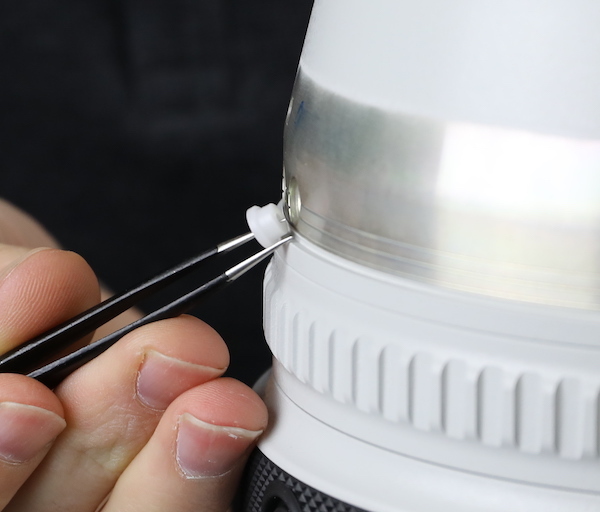 Like all modern people my entire world is held together by tiny screws that seem to be coming loose all the time…so who does make the best tiny screwdrivers? And I thought he was just doing it for a laugh! I’m so disappointed, all along I thought you did these tear downs out of the kindness of your heart for our education and to point out to the manufacturers that you could work out how to adjust their lenses with your equipment as well or better than they could! Now I find it is purely so that you can create an in house repair manual. Thank you for another fascinating look in to a world that I might be able to join after they release IV when I can be 3 generations behind. The weight saved by the new lens design (all but the first element are quite smaller and positioned rear in the barrel) is pretty significant. I never imagined to see a ~3kg 400/2.8 or 600/4 lens (with build quality they need and have) with just 3kg. Do you think it might be also beneficial for them from the financial point? After all, smaller glass elements are used, which might be possibly easier to manufacture (therefore cheaper, while the MSRP remains the same). In that case, that might be a win-win situation for Canon. Although, that is pure speculation, as the new design might need newer, tighter tolerances overall, or more specialised glass. Still, pretty much impressed. Great teardown. Regarding fanpeople – I find it quite interesting, as I can usually see more bashing of Sony than any other brands. Sounds like a competitor’s rendition of the review. Very funny. Love it. I did. It’s grown back now! Yes. When Roger calls out the specific thing that irritates him, he actually really means everything else. The specificity is just a funny little placeholder. Roger is funny, and this is his way of conveying what is really amusement and approval underneath the veneer of irritation couched as literary humor. We all laugh with Roger.